Is it hard to write while holding pom poms? Why are there virtually no sports reporters in America's newsrooms and just so many cheerleaders? The New York Times did a great piece the other day on opioid addiction retired NFL players suffer. There's a great quote from the NFL Commissioner. What a crock. If the NFL were actually concerned about an athlete's health, the league wouldn't exist. Football causes brain damage. That's well documented. But today as fans around the country drink and get blitzed as they watch a game that causes brain damage and leads to drug addiction, there's a question anyone who actually cares about an athlete's health should ask: where are the sports reporters? Back when I was a kid, you could page through a magazine and find an ad featuring a doctor telling you what cigarette to smoke. 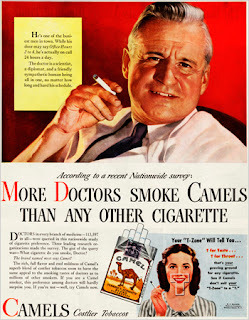 Doctors preferred Camels, the brand that gave lung cancer to Chuck Connors, the Rifleman. Along came medical science. Reporters reported. The public was informed. Behavior changed. With concussions, medical science came along again. This time, most reporters didn't report. It took a movie starring Will Smith to inform the public. On Super Bowl Sunday, there are basic questions sports reporters should be asking Division 1` university presidents. 1. Why do you continue to support and promote a sport medical science has documented causes brain damage? 2. Why does the football team give more full scholarships than any of your academic colleges? 3. Why does the university give a full scholarship to an athlete who cannot read past grade-school level? 4. Why does every football coach get a free car? And every newsroom, particularly local TV newsrooms in America should ask: when are our sports reporters going to put down their pom poms and do some reporting? When will someone in our newsroom finally do an accountability interview with a university president? When journalism fails, it's easy to understand why we continue to support a sport that causes brain damage and leads to drug addiction. When journalism fails, bad things happen.